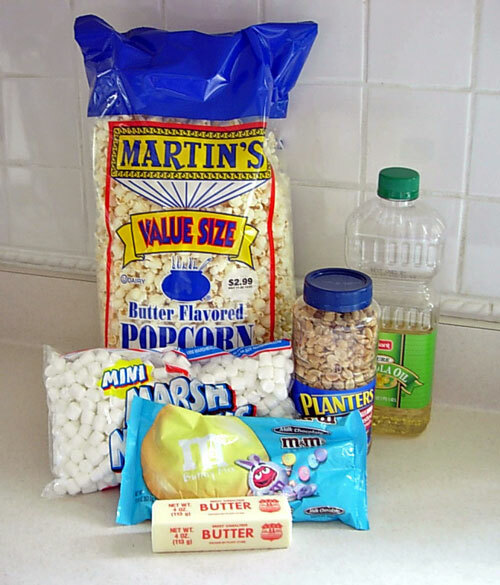 When you are looking to make something sweet to take to bake sale or pot-luck and you want something besides, brownies or cupcakes, this easy to make Popcorn Cake recipe will be a hit with both young and old. I use to make Popcorn Cake on a weekly basis when my daughters were growing up. It was a great recipe to make to take to bake sales as it looks so unique and colorful among all the brownies on the table. 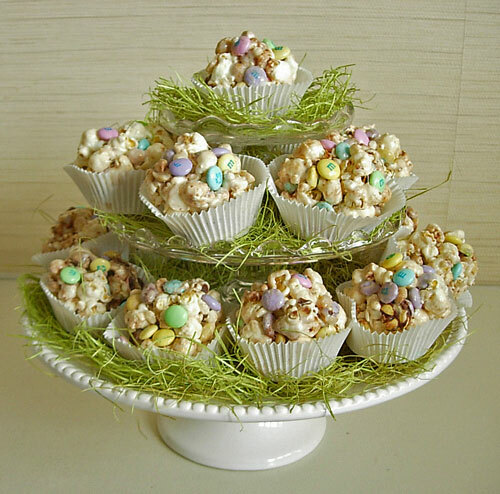 Popcorn Cakes also works well for Easter when I always form them to look like pastel little nests. When you make them into round balls they are fun to eat after sports practice, parties, and can be made in 20 minutes. They are sort of like Rice Krispie treats, but with a twist. 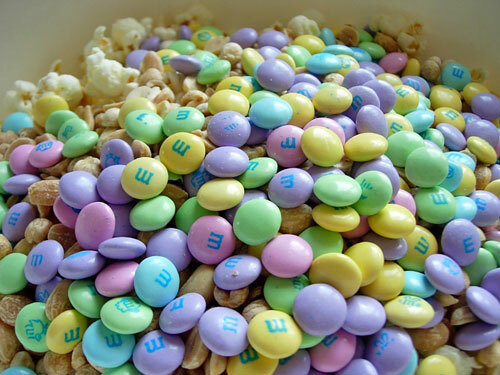 I made these as Easter treats using pastel M&M’s, but you can alter what color candy you add for any holiday or occasion. 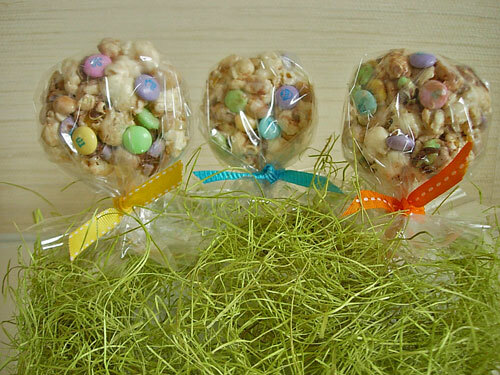 You can even make the Popcorn cakes into lolli-“pops” by sticking a lollipop stick into each one after rolling it and pressing it flat with the palm of your hand. Making them this way will look very festive in Easter baskets. 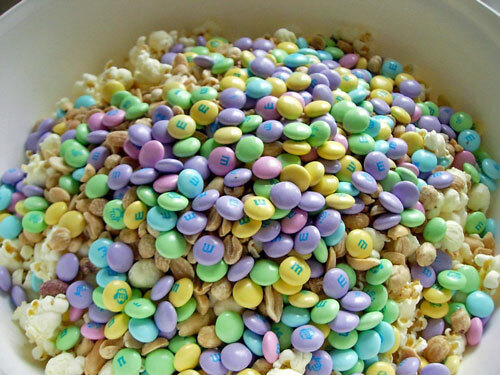 Mix together in a large bowl: popped pop corn, peanuts and M & M's. Set aside. 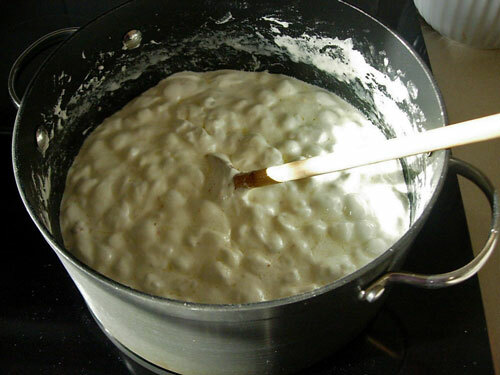 Mix together and boil for 2 minutes: margarine or butter, vegetable oil and mini-marshmallows until melted. Pour melted mixture over popcorn mix and mix well. Rub vegetable oil over hands before forming popcorn cake mixture into shapes so the mixture will not stick to your hands. - Shape into balls and place in cupcake liners. - Shape into balls and then on a sheet of wax paper, flatten with palm of hand to make lollipops - push a lollipop stick into each, let cool. - Press into baking pan and cut as you would cut a brownie. When taking them on a plate or container, use wax paper in-between the layers to lessen each cut of the popcorn cake from sticking to the others. 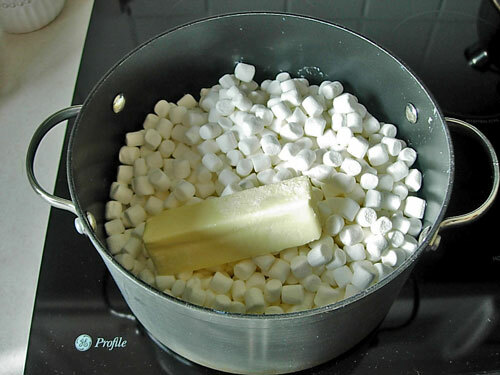 Melt the marshmallows, margarine, and oil in a pot. Mix popped corn, peanuts, and M&M’s together in a large bowl. 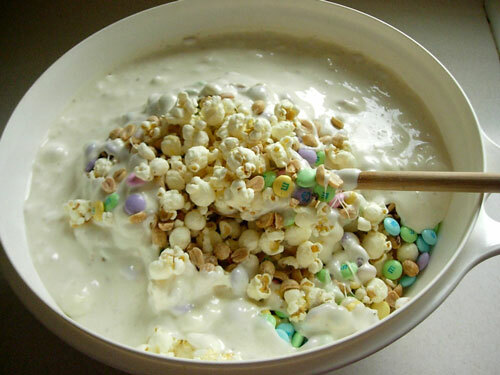 When marshmallow mixture is melted, pour over pop corn mixture. Rub vegetable oil over your hands, then shape the mixture into balls. If you don’t do this the mixture will stick to your hands and you won’t be able to mold into balls. I made mine a bit smaller than a tennis ball. Place on foil, wax or parchment paper. Place each ball in a cupcake liner. For more tasty recipe ideas head over to my Favorite Recipe Gallery. 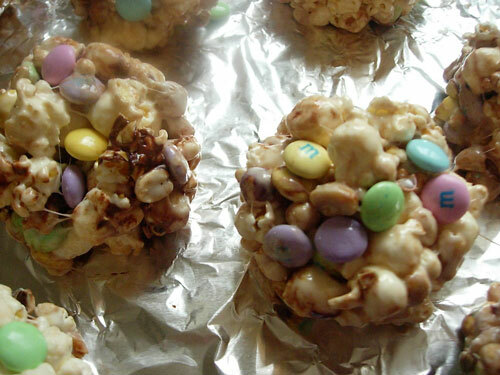 I tried this with mini eggs and they melted when I poured the marshmallow mix. How did you get the m&ms to not melt? I used M & M’s – they don’t melt. 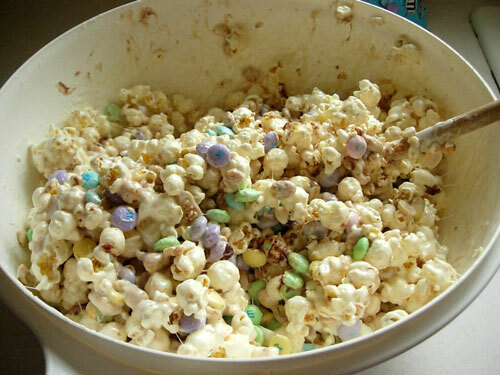 If you want to use the eggs – try mixing the eggs in last after you have mixed the melted butter/oil/marshmallows in to the popcorn. This way it will be a bit cooler and won’t melt the eggs. Happy Easter. How much popcorn is one gallon?? Hi Sarah – I always bought a pre-popped bag in the snack aisle at the grocery store and measured out 16 cups. You can use more or less depending on how gooey you want the cake to be. how much is one stick of butter? I am SO making this for the kids on Sunday! Oh…my favorite Easter candy is either the Reese Peanut Butter Eggs or our local candy factory’s Peanut Butter Melt-a-Way Egg! Wow- I have never heard of these. They look AMAZING. I wish I could make them tonight… so many of my favorite things. I’ll be linking in my next Crafty Food Roundup. Oh, these look divine! My daughter..who just so happens to Lu-UV m&m’s and popcorn will have fits over these. And I will be the best mom ever. Well, for a little while anyway. Those are adorable, festive and look so yummy~! thanks so much for the recipe..
My favorite Easter candy is Peeps…frozen! Yummy, the girls and I will have to try this, give me anything with M&M’s and happy. Hope you had a great weekend. My favorite Easter candy is anything Reeses, and now they have dark chocolate Reeses…pure heaven!